Getting back to the image, each of these drops and droplets began to take shape as invisible molecules of water vapor high in the atmosphere by attaching themselves to a nearly invisible dust particle. As more and more molecules attached—coalesced—and their weight increased, gravity pulled them down through the atmosphere causing even more coalescence. When a gazillions of these infant droplets grouped together, attracted by their electrical charges, their size increased even more to form a cloud where more attraction and more coalescence resulted in drops that literally, well, drop. The coalescence continues even when the drops splatter and run. 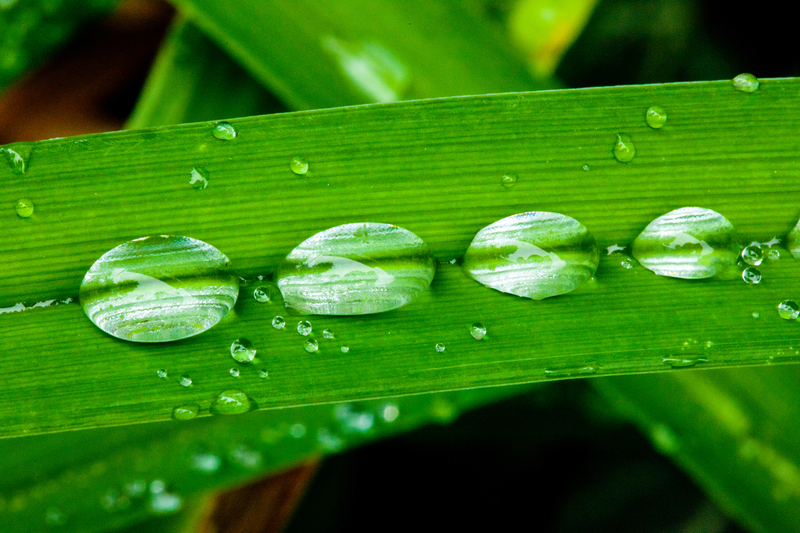 Notice, the drops in this image did not land on the leaf and line up this way for the picture. Their sizes and alignments are a product of their travels, conditioned by the physical forces and electrical fields they encountered along the way. Already, they are changing state, evaporating into the atmosphere. 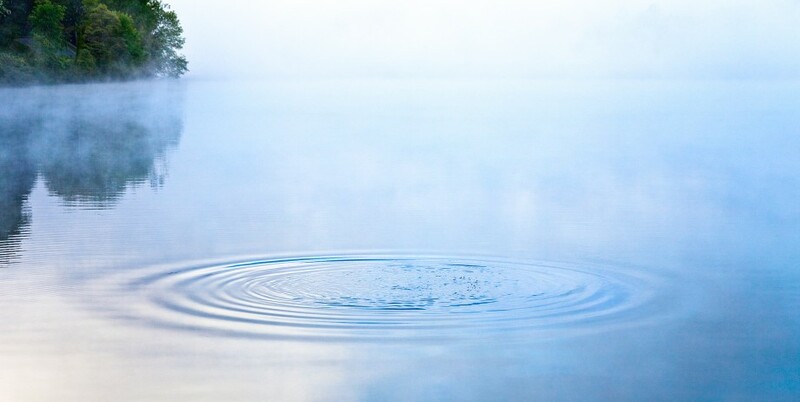 In the liquid state drops of water assume a rounded shape because a sphere requires the least amount of energy to form and has the least possible area for the volume it encloses. That makes it the most economical, energy-efficient way of enclosing and separating two volumes of space—water and surface. Aside from the physics, I love the aesthetics—how the drops are transparent and reflect the sky. Earth and sky integrated. Another feature that comes to mind when contemplating this image is the water cycle, the change of state: liquid—vapor—solid (ice). It’s a perfect metaphor for transformation because water is constantly changing. Like the universe and all it contains, there is rising and falling. Birth and death. Breathing in, breathing out. Lub dub, lub dub. Drip. Drip. In preparing this post, I was delighted to find Ken Wilber’s quote in my database. It beautifully conveys the transcendent perspective, connecting being with perception. Having enjoyed a career as a visual communicator, I appreciate the significance of perception and the opportunity to expand it. We become more by seeing ourselves as more. Indeed, looking deeply generates appreciation. And that can take us to the place where we are the sun, the rain and the earth. It was late evening and after a hard rain, Linda’s garden was dripping wet. I took a rubber gardener’s mat to kneel on, and set my digital camera on a tripod with a macro lens. I did nothing to alter either the leaves or the drops. They were as you see them. The mode on the camera was set on “automatic.” In Photoshop I darkened the background shadows to eliminate some distracting elements. This entry was posted in Uncategorized and tagged change of state, coalescence, drops, leaf, rain, raindrops, transformation, water cycle. Bookmark the permalink.